… pulled out this dress and I barely remembered it at first, so she showed me a picture of myself wearing it. It was really red, I said. It was, she said, and then started telling me that she once saw the ruby slippers from the Wizard of Oz and they’re not as bright red as they used to be either. I’m so sure you saw the real ruby slippers from the Wizard of Oz, I said, and she said she sure did because her Aunt Virginia took her to the Smithsonian once and they have all that kind of stuff you’d ever want to see. You got to go to all the cool places, I said. You went on a good long vacation once, she said, but I think she’s probably referring to the vacation when I stayed at a motel with a swimming pool of which excuse me but I don’t even remember at all so what good is that? 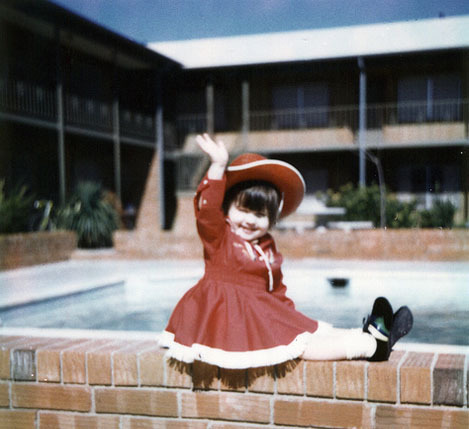 I asked her what happened to the red hat that went with this outfit, but she said I left it in the motel room and when she talked to them on the phone later they wanted five dollars to mail it to us but that was twice as much as the hat cost in the first place. Saw THE ruby slippers about 2 weeks ago when I took my daughter and her latest bf downtown to walk the monuments and do museums. Saw Harry Potters Gryffindor robe from Chamber of secrets. Not sure they really belong in the same building. At least they weren’t in the same exhibit. The slippers were near THE video camera that filmed the 9/11 planes and THE Kermit the Frog. The robe was near some stuff I don’t remember….sounds right.